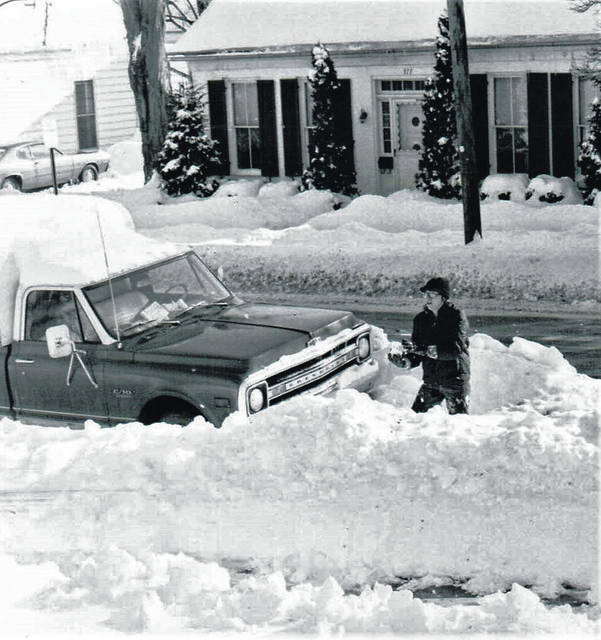 Hillsboro resident Glenna Walker, who was 15 years old when the Blizzard of 1978 dumped more than a foot of snow on top of what was already on the ground in Highland County, is shown shoveling out her pickup truck on West Walnut Street. 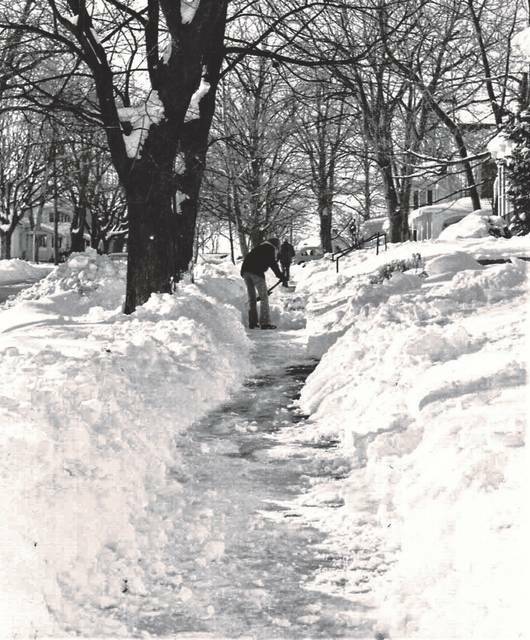 The long task of digging out from the ‘78 blizzard is seen here on a sidewalk in the 300 block of West Walnut Street in Hillsboro. Substantial amounts of snow were still visible throughout the area one month later. Forty-one years have passed since a winter storm of legendary proportions crippled Highland County and all of southwest Ohio, and for Roger Bennington, the Blizzard of 1978 was one for the record books. Bennington, who now lives on Pence Road near Hoagland, told The Times-Gazette that the previous summer, he had bought a new four-wheel drive Ford truck and still found it difficult to navigate the snow covered roadways that had drifts several feet high. He said in the aftermath of the blizzard, it was a common sight to see a three-foot tall snow drift on a major highway like U.S. Route 50 or SR 247, but on county roads he saw drifts that towered six feet or more directly in front of him. Then, as now, people were asked to check on the elderly, and he remembered an older couple that lived back a long lane close to where he lived. When he went to see how they were doing, he got his new truck stuck in a big snow drift. The next day, he said, he took the neighbor’s wife to the store to get groceries and never worried about getting her back home. According to the National Weather Service, the standard by which future winter storms would be judged had its beginnings late on Tuesday, Jan. 24, 1978, in a moisture-rich Gulf low pressure system over Texas, while an unrelated low pressure area hovered over the upper Midwest. The NWS called it a “storm of unprecedented magnitude” as it headed for Ohio and six other states on Wednesday, Jan. 25, initially bringing with it rain and fog, and moderate temperatures in the low 40s. The weather bomb exploded during the early morning hours of Jan. 26, 1978, with the weather service issuing blizzard warnings of heavy snow, high winds and bitterly cold temperatures that brought with it arctic wind chill readings. He said that southbound SR 72 had become treacherous and snow covered, with several cars and trucks in the ditch, and they stopped to help as many they could before realizing they might not be able to return home. Weather service historians reported that blizzard conditions hit the area around 1 a.m. on Jan. 26, bringing with it near zero visibilities, over 50 mph wind gusts that created 20-foot tall snow drifts from the nearly 12 inches of snow that fell, and potentially fatal wind chill values nearing 60 degrees below zero. He said his family was snowbound for the next several days with county road crews finding the most effective way at snow removal on many back roads wasn’t a snow plow, but a tractor with a front end loader. In Ohio, Kentucky and Indiana, the National Guard was activated to help clear roadways, deliver food and medical supplies, restore power and conduct emergency rescues. The death toll rose to 70, according to The Cincinnati Enquirer, with 51 of those deaths coming from Ohio alone. Of the Ohio fatalities, the newspaper reported that 22 were individuals who had abandoned stranded vehicles and homes with no heat, only to die of exposure. Another 13 froze to death trapped inside their vehicles when the blizzard hit, and another 13 died when their homes lost power and heat, the paper reported. The Ohio Department of Natural Resources stated the blizzard took its toll on the northern bobwhite quail, estimating that a substantial number of the birds died from the cold temperatures and lack of food. After the storm passed and spring arrived, the ODNR was shocked to discover that more than 90 percent of the bobwhite quail population had perished during the blizzard, and it cancelled the bobwhite hunting season statewide as it came to grips with how to repopulate it. After 41 years, the ODNR says that the population of bobwhite quail is still at near record lows. According to the U.S. Postal Service, it was the first time since the Great Flood of 1913 that mail could not be delivered. The storm produced several record-breaking statistics, according to various reports, such as the lowest barometer reading in history at 28.66 inches, the highest amount of snowfall in a 24-hour period at 12 inches, and wind gusts of 69 mph that brought with it record low wind chills of -65º F.